USA v Germany is one of World Cup 2014’s most anticipated matchups and will now decide who will win Group G. Germany is a strong favorite at Intertops Sportsbook. The three-time world champion only needs a draw to win the group and so is quoted at -2500, with the Americans at +900. USA coach Jurgen Klinsmann and his German counterpart Joachim Loew are good friends, but they’re both equally determined to win. Klinsmann, who coached his country at the 2006 World Cup with Loew as his assistant, has made it clear that he wants to beat his homeland and win the group. 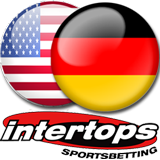 Intertops is offering a risk-free live bet on the USA vs Germany game on Thursday. If the first live bet placed on this duel isn’t a winner, it will be refunded as a free bet (up to $100). First, there's an attractive stake-back option on one game on every matchday of the tournament. For example, today bettors can claim back up to $100 if Lionel Messi scores two or more goals when Argentina meets Nigeria. Every customer wagering at least $50 (minimum odds +100 / 2.0) on a World Cup match day is automatically in a draw for a $500 cash prize. Every further $50 wagered means another chance to win. And if you place at least $2000 (minimum odds -200 / 1.5) on World Cup bets you can claim a $200 Free Bet in time for the final on July 13th. Intertops – the world’s very first online sportsbook -- is taking bets on everything from Tournament Top Goalscorer to whether the final will be decided in 90 minutes (-303), extra time (+400) or in a penalty shootout (+450).